A friend in need is a friend indeed, do you think? I don’t know the exact origin of this phrase (although the finger is pointed at a certain Quintus Ennius), but I do know that anyone in any kind of need can do with a tasty date loaf. And if you are of my age and vintage in life, you may well have Placebo running through your head at the moment too. This recipe brings together a few of my favourite things: butter, brown sugar, and Bin Inn. I won’t start up again about how much I love Bin Inn (I’ve done so on previous occasions, if you are desperate to know more), but I will say they do make a fine date loaf, on which I have based this version with a few of my own tweaks. Knowing me by now as a somewhat lazy baker, you are probably not surprised that this requires very little effort and can be mixed up using only one bowl. You have to chop the dates yourself, but I bet you could find pre-diced ones somewhere, and voila, even easier. I am taking this little number, all cutely dressed up, to drop over to a friend who is plagued by a most unkind virus. 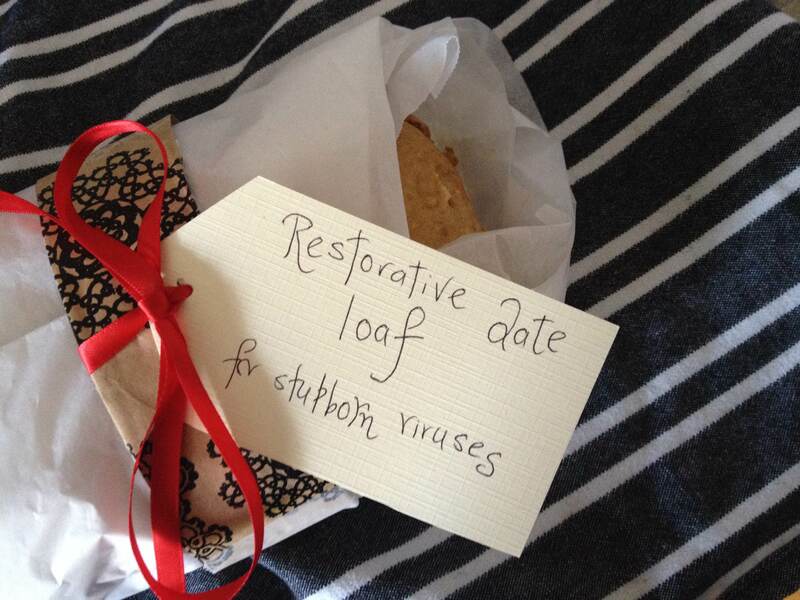 I’m hoping my date loaf will bring a little solace, and if not, at least a little sugar. So if you find yourself in need, give this one a try. Line a loaf tin with baking paper and set the oven to 170 degrees celsius. Place the dates, sugar, baking soda and butter into a large-ish bowl. Pour over the boiling water and leave to cool. Add the flour, cinnamon, ginger, egg, baking powder and golden syrup. Combine and pour into the prepared loaf tin. Bake at 170 degrees celsius for 45 minutes, until a skewer comes out clean. So nice to ‘hear’ your voice in this blog, my dear! Very enjoyable. 😊 I hope you are well and I look forward to talking to you soon! PS, I ALSO love Bin Inn!!! truly, madly, deeply. And very much bemoan its lack over here!! !